To kick off the summer 2014 grilling season, Primo Ceramic Grills sought to create a high profile promotional event that would drive valuable consumer traffic to their local retail partners. A key objective of the promotion was to engage top tier channel resellers, which in turn rewarded customers by ensuring that they would find a local dealer that offered the widest selection of Primo Ceramic Grills products, the most knowledgeable sales staff, and the best deals. 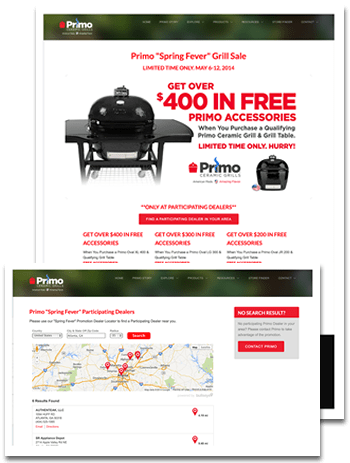 Primo Ceramic Grills launched their “Spring Fever” grill sale with local coupons featuring a targeted local search powered by Bullseye’s turnkey, cloud-based store locator. The two week promotion featured only store locations qualified as “Primo Elite” or “Jack Daniels Elite” dealers, and offered $400 free accessories with the purchase of a new grill. The campaign was fueled by a multi-channel advertising push that included Facebook posts, print ads, web ads, web events, and a spot on their own homepage. All channels linked to a common, mobile-friendly landing page, which in turn linked to the dealer locator software, including Bullseye’s built-in mobile interface. A sampling of the top locations showed an average lift in location views of 82%. Some stores saw over 110% lift. The dedicated local dealer search received over 2,100 search requests within a two week period, resulting in over 3,300 individual location exposures. A sampling of the top locations included in the promotion showed an average lift in locator views of 82% for the same time period over the regular Primo Ceramic Grills store locator; some stores received as much as 110% additional customer views. The promotion also had an unanticipated secondary benefit: many dealers not included in the program expressed interest in becoming elite dealers, demonstrating increased engagement.